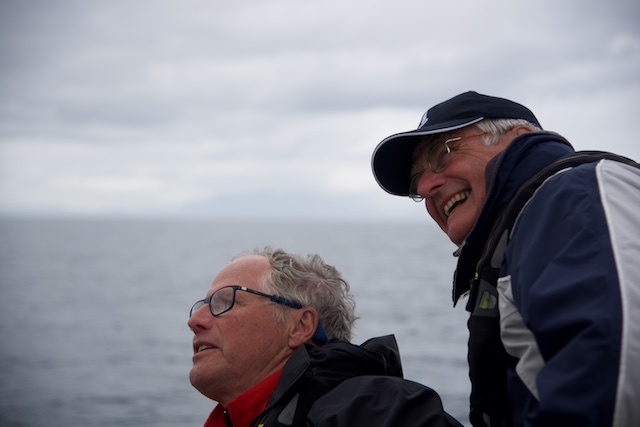 It was thanks to my good friend Lorens, who had sailed with Leon before, that I got in touch with Reginasailing. 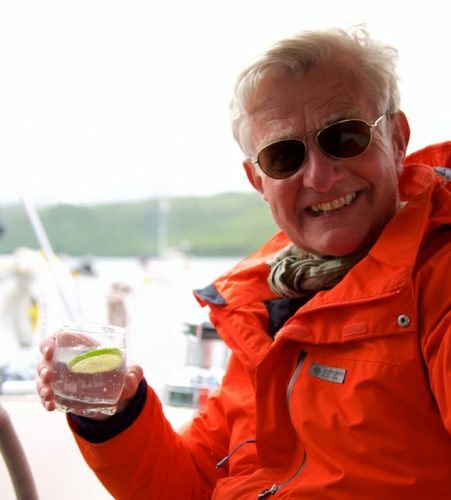 Lorens asked me if I wanted to join in 2018 and so it became: One week’s sailing in Scotland with Oban as our base. 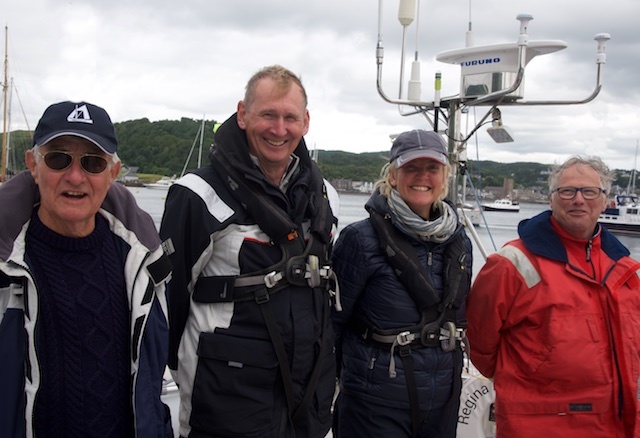 My friend Lorens (left) had sailed with Leon before and asked if I would join him on a leg in Scotland. 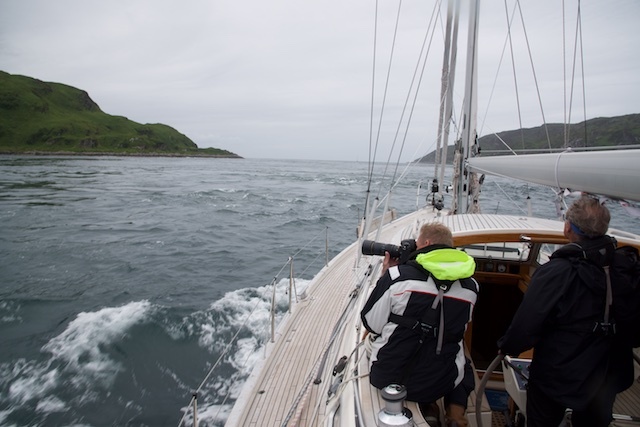 It became a fantastic great sail under typical Scottish conditions: God winds, often rain, quite cold. In other words: For us Swedes nothing worse than typical Swedish summer weather…. My already high expectations were surpassed by a huge amount! Lorens and me sailing on a sunny day in Scotland! 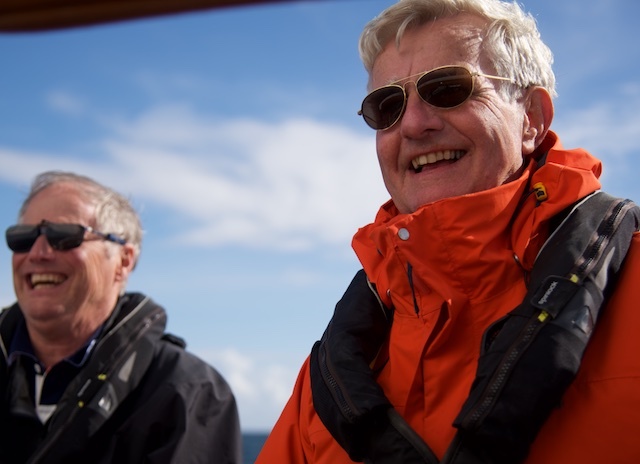 I have met many captains throughout my long life at sea; naval captains, commercial captains and many, many leisure skippers. You name them, I have met them all… And in the long row of captains I have encountered, one is outstanding. I must say, Leon is highly professional and what I would call a “real captain” in all aspects. 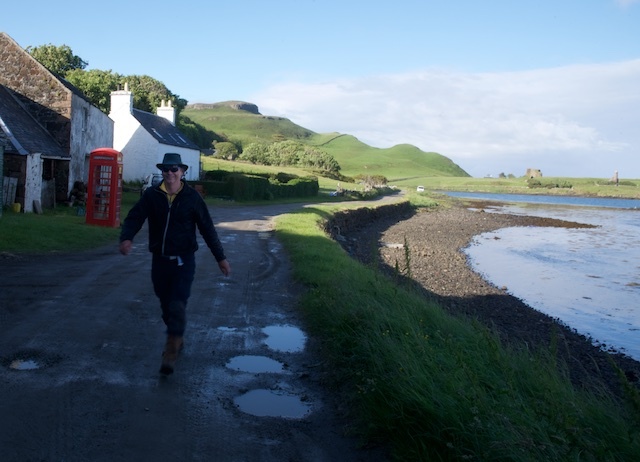 Our captain Leon in Canna. 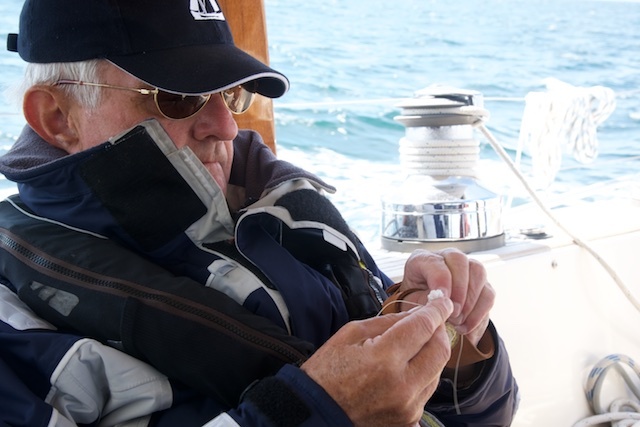 It is not often that I have met someone who is so precise when handling or manoeuvring his yacht. Totally calm, sovereign and well thought-through in every detail, he moves his boat in all situations as if she formed part of his body. At the same time, he fully involves his crew to the desired or necessary amount, so we all feel involved and engaged. 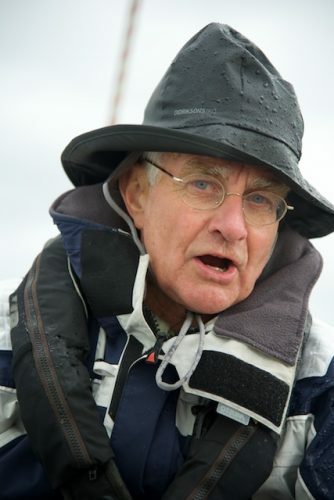 We were all highly involved in the planning process of every day and Leon left it to us where we would like to sail and when. 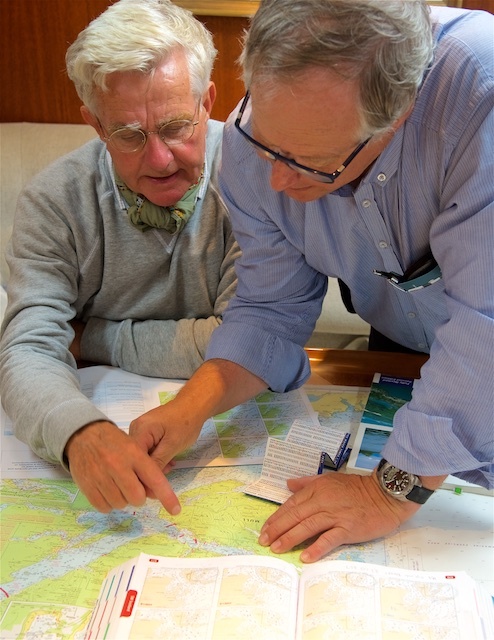 Leon’s vast knowledge of the sailing area came in handy, obviously, and he could give great suggestions where to we could sail under the prevailing weather situation. Leon’s pedagogical skills can not be stressed enough. Irrespectively of one’s own level of competence, Leon always finds the correct level to explain and demonstrate, always remaining on equal eye level. 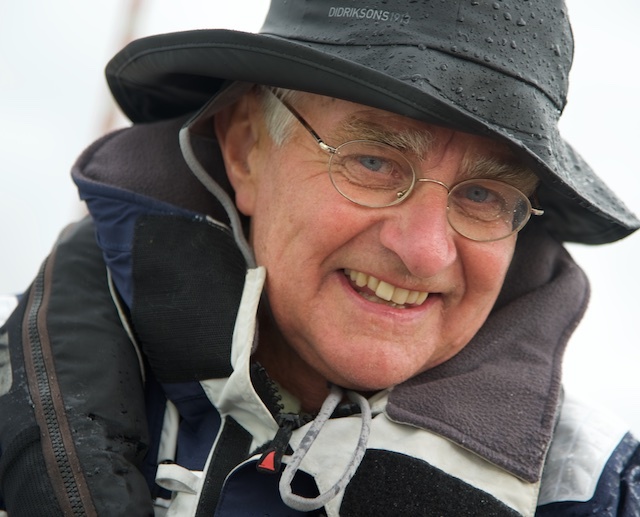 Always full of respect and understanding for his crew, he passes on his deep knowledge, seamanship and skills on such a natural way that it all feels as if there was no other way than doing it right and in no rush! 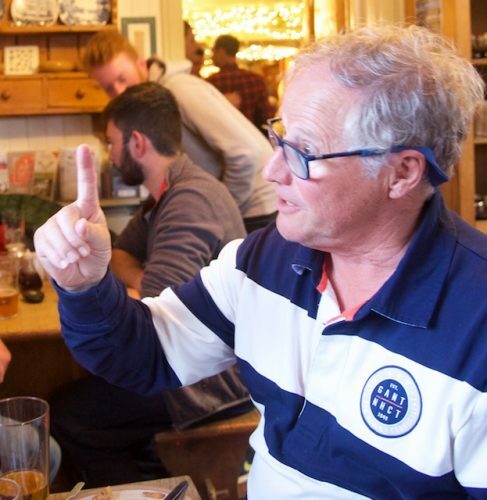 “Slow is Pro”, Leon reveals, while explaining a manoeuvre in detail to his guests. From newcomer to highly experienced ocean sailor: On Regina Laska, everyone can learn something! 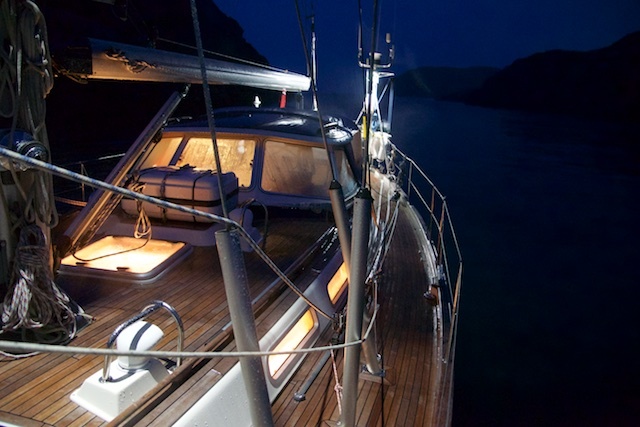 Anchored in Tinker’s Hole close to Iona for the night after a sauna onboard. We had an extremely enjoyable time onboard! As most sailors know: a good atmosphere and a good co-operation creates a “Happy Ship”, which is the essence of safe and pleasant sailing. Basically, it all evolves from the captain onboard and then spreads onboard in the form of “Happy Ship” – and Regina Laska is definitely a “Happy Ship”, no doubt! 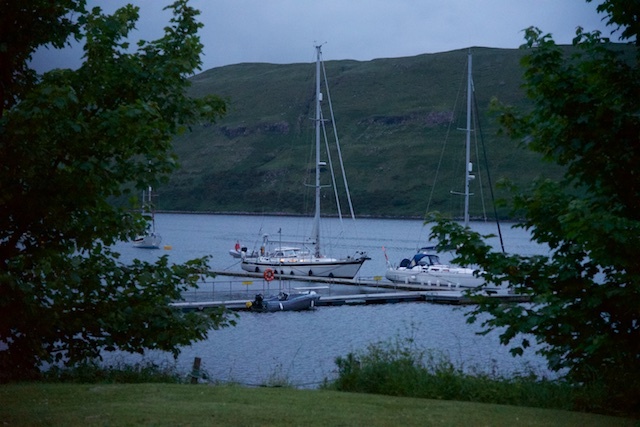 Our “Happy Ship” Regina Laska berthed at the Talisker Distillery. Obviously, how happy a ship gets is also significantly made up by the fellow crew mates onboard. 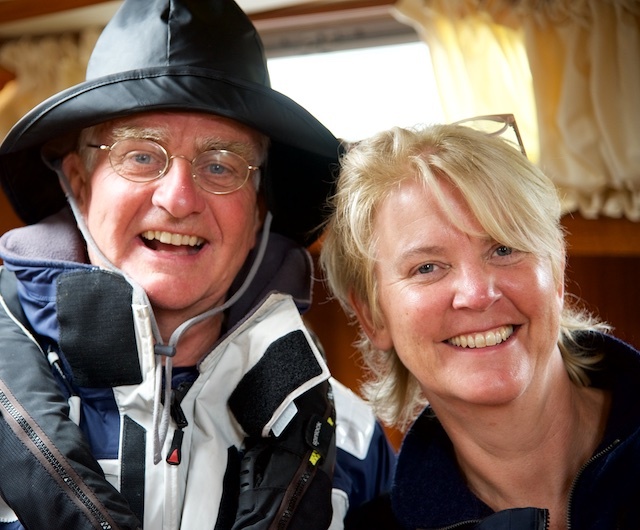 Also here, I felt we had a fantastic team with Viveka and Erik, who were both very experienced sailors and who had exciting plans for their own future sailing adventures, to say the least! A special thanks goes to them! Our great crew: myself, Erik, Viveka and my good old friend Lorens, whom I have shared tens of thousands of nautical miles with! Erik, Viveka’s spouse, was seldom seen without his camera and never seen without a smile on his face! And of course, I must not forget to mention Regina Laska! An increasable well equipped vessel! Every detail of the profound and complex technical equipment is in top condition and looked after in every detail. Generally, all systems have a full backup systems or are redundant and everything is professionally documented. As one can see on this homepage, there is nothing missing onboard re equipment, coding, documentation or continuous refit! For anyone dreaming of blue-water sailing, Regina Laska is an excellent reference model. System design for navigation and safety equipment is simply state-of-the-art! There are check-lists and stowage plans for everything and even a 195 pages heavy “operation manual” written by Leon to document what he is doing when, why, how often and in what way. 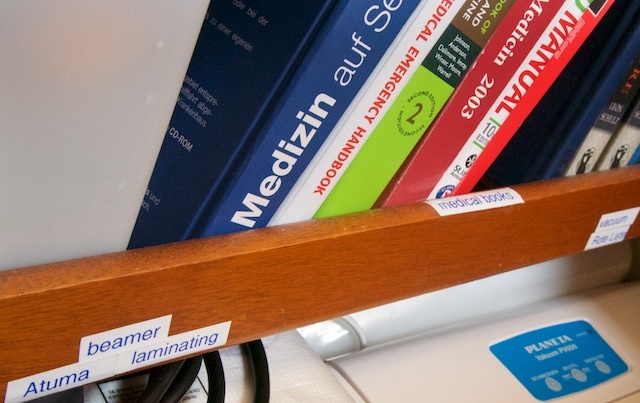 Not to speak about the seven thick files with manuals and instructions! 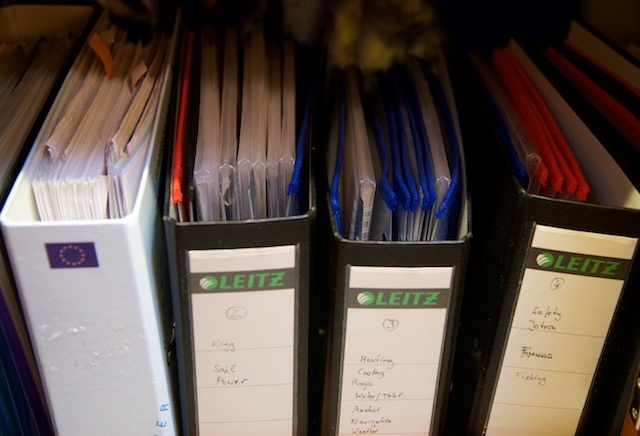 Some of the seven files full of manuals and instructions for all the onboard systems. 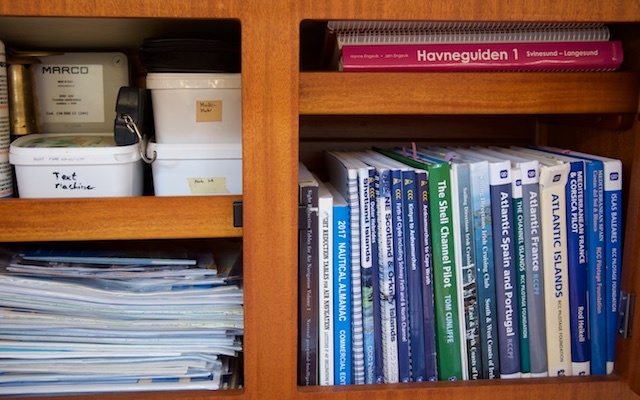 Some of the pilot books (right) and Imray Charts (left bottom). Everything neatly marked for easier finding and organisation. 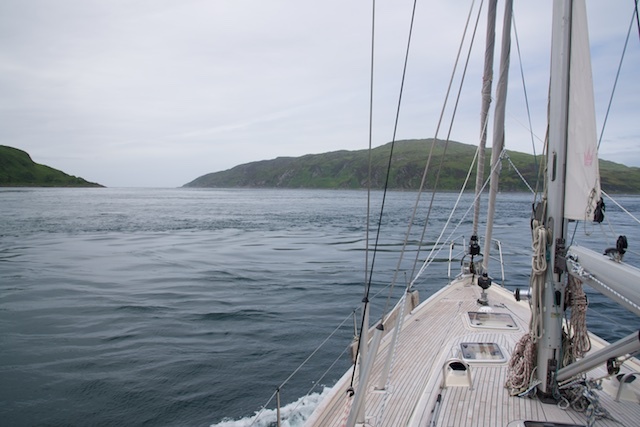 Sailing in these Scottish waters in the Hebrides offer a fantastic nature and unforgettable experiences! 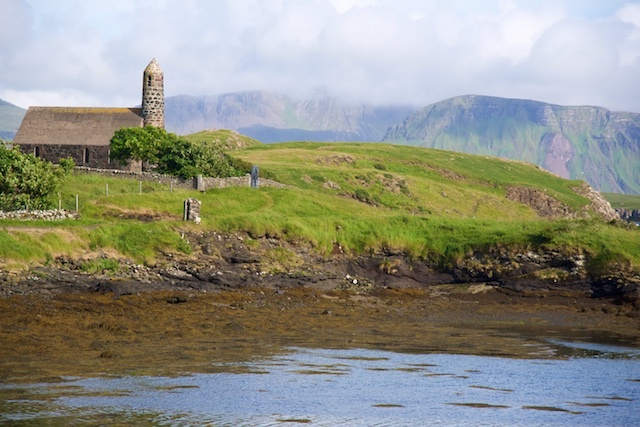 The Isle of Canna was my favourite island and sailing through the Corryvreckan was the highlight of the week! 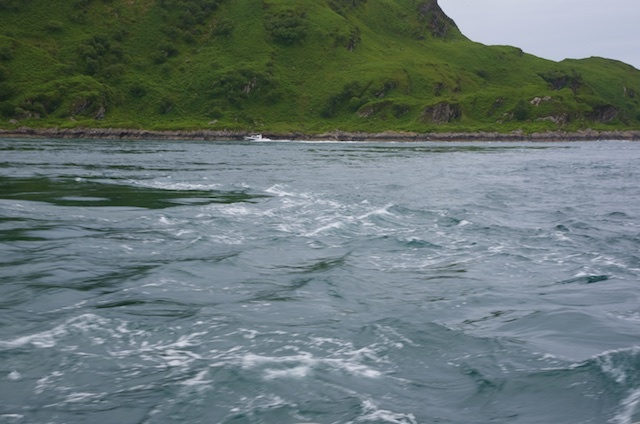 The current of the Corryvreckan. 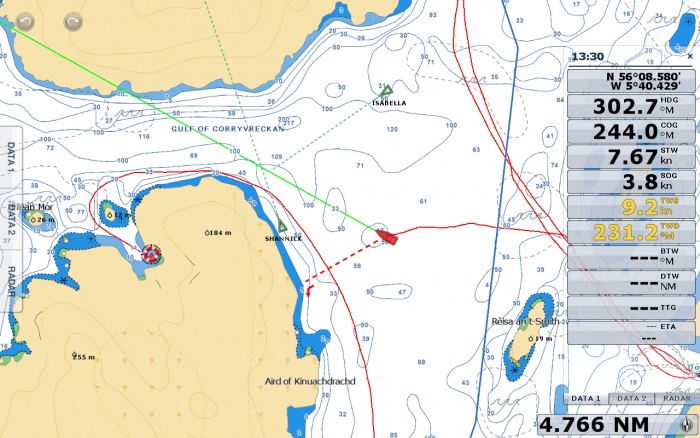 Approaching the Corryvreckan in a south-going current. Please note the angle between heading (green) and course over ground (COG, red dotted). 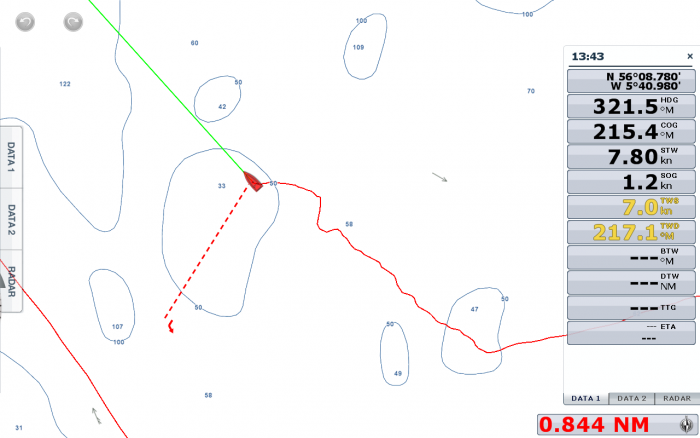 The other sailing vessel “Isabella” had a similar heading towards Northwest, but was pressed to southwest like us (green dotted line showing the COG). Regina Laska almost standing still (Speed over Ground (SOG) = 0.8 knots) while motoring full ahead (Speed through water = 7.05 knots). Current is thus over 6 knots. 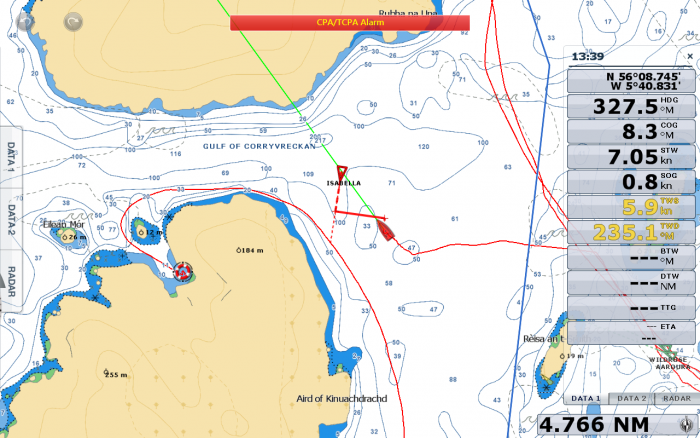 Isabella is on a westerly heading trying to sail into the Corryvreckan, yet being pushed heavily southbound. The crew desperately trying to keep a steady course through the eddies and overfalls. Speed through water now 7.8 knots trying to beat the 7 knots of current, making no more than 1.2 knots over ground. Course over ground COG is 215 degM (red dotted line) while Heading (HDG) is 312.5 degM (green line). The wake show how difficult it is to steer a steady course. Since Leon, who has been here many times before, correctly judged the situation being neither dangerous nor risky, and not even uncomfortable, yet “a very slow exercise” as he put it, he said we could go for the experience, since the weather was totally calm. It was an experience I will never forget! 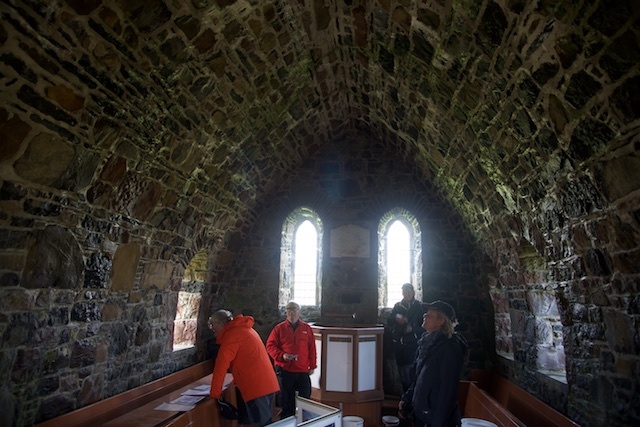 The feeling of the high Scottish islands and the open seas gave a holistic experience and unforgettable days. For a Swede, the area is surprisingly easy to navigate. The islands have significant contours and, generally, lack underwater rocks like we are used to have in Sweden. Tidal streams an tidal heights do form part of the navigational concept, of course. And it is unadvisable to sail over any considerable wind over tide situation. 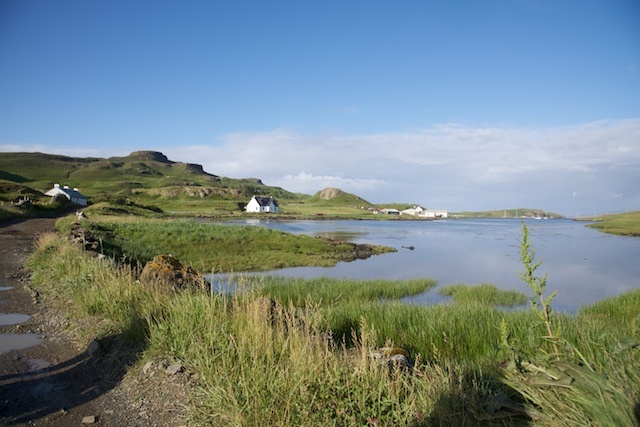 Nevertheless, these Hebridean islands offer great opportunities to practice tidal calculation in real life and therefore Scotland forms a fantastic area for tidal navigation. 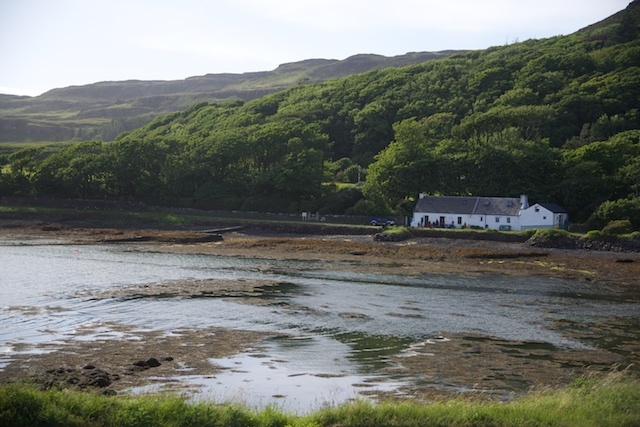 One of the few houses on Canna was a pub. What else?! To sum up: Regina Laska with her captain Leon offer sailing guests a complete sailing adventure of the highest imaginable class. I really hope that I may come again! Helping Leon with some rope work. On some recently purchased ropes there were still some whipping know missing. Something that needs to be fixed onboard Regina Laska! 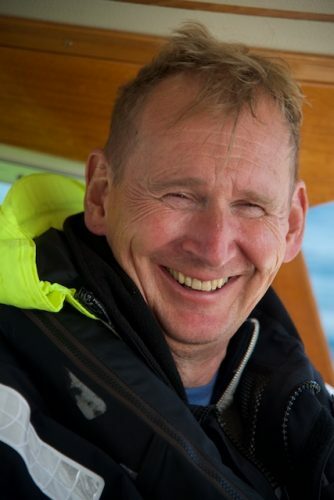 Anders Isberg, Ex Naval Officer in the Swedish Navy, sailing leg 6-2018 from and to Oban, Scotland.